Pierre Michel Alix, "Francklin," hand-colored aquatint, after the painting by Charles Vanloo, Paris, ca 1790. 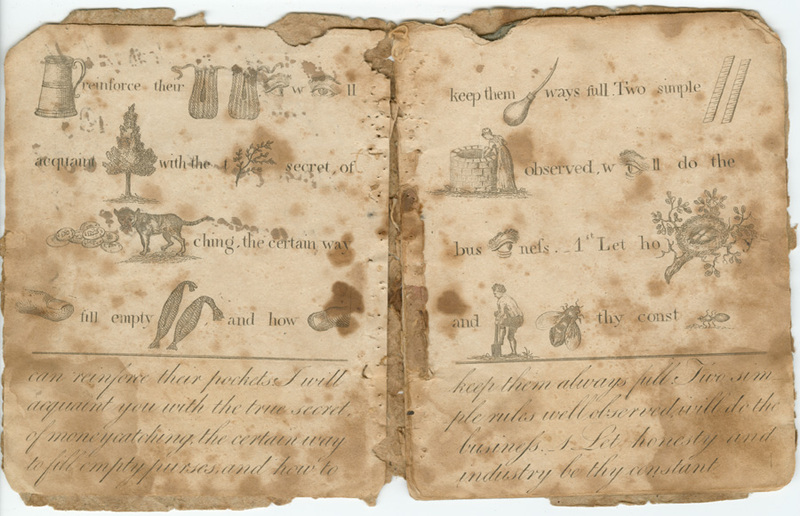 For the Preface to the 1758 edition of Poor Richard’s Almanack, Franklin strung together many of the proverbs that he had previously used in his almanacs to create a curious fiction. Poor Richard goes to the market, where he hears an old man called Father Abraham preaching to the assembled crowd, quoting the proverbs of Poor Richard on the virtues of industry and frugality. The Preface is an ironic critique of authorship. Poor Richard, a mere almanac maker, craves fame as an “Author” for his “Works” and is delighted that Father Abraham treats him like a scriptural authority, invoking his name no less than 49 times. The people who hear Father Abraham’s speech ignore his advice and proceed to spend their money as foolishly as before. In the 1770s, however, Poor Richard’s 1758 preface was rewritten; most of the passages about authorship were taken out, so as to put the emphasis on the maxims about industry. By the nineteenth century, under the new title of The Way to Wealth, this revised version translated into just about every European language, and reprinted countless times in every possible format. If it has established Franklin’s fame as the apostle of frugality, Franklin himself was partly responsible, since he himself had a hand in rewriting and renaming it. These Proverbs [in Poor Richard], which contained the Wisdom of many Ages and Nations, I assembled and form’d into a connected Discourse prefix’d to the Almanac of 1757,10 as the harangue of a wise old Man to the People attending an Auction. The bringing all these scatter’d Counsels thus into a Focus, enabled them to make a greater Impression. It being universally approved was copied in all the Newspapers of the Continent, reprinted in Britain on a Broadside to be stuck up in Houses, two Translations were made of it in French, great Numbers bought by the Clergy and Gentry to distribute gratis among their poor Parishioners and Tenants. In Pennsylvania, as it discouraged useless Expense in foreign Superfluities, some thought it had its share of Influence in producing that growing Plenty of Money which was observable for several Years after its Publication. [Benjamin Franklin], Poor Richard Improved. 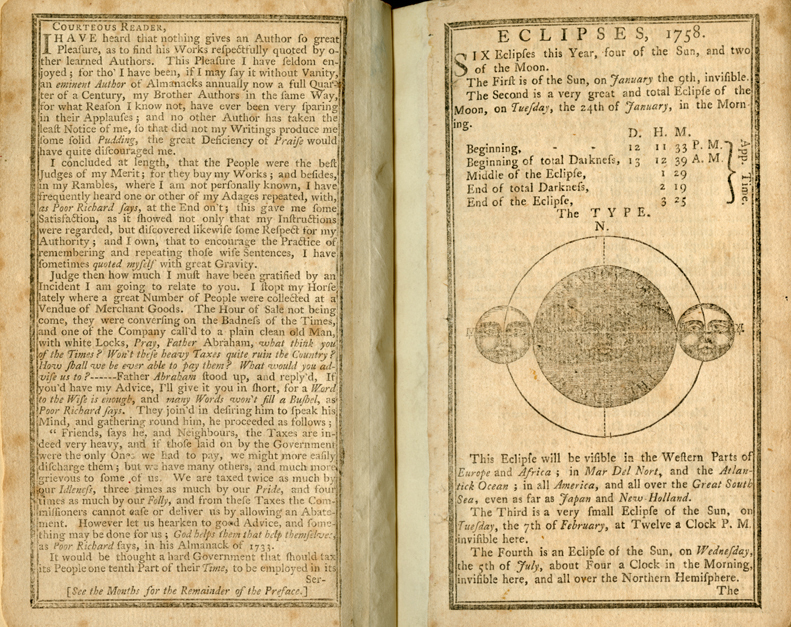 Being an Almanack… for…1749 (Philadelphia: Printed and sold by B. Franklin and D. Hall, ). 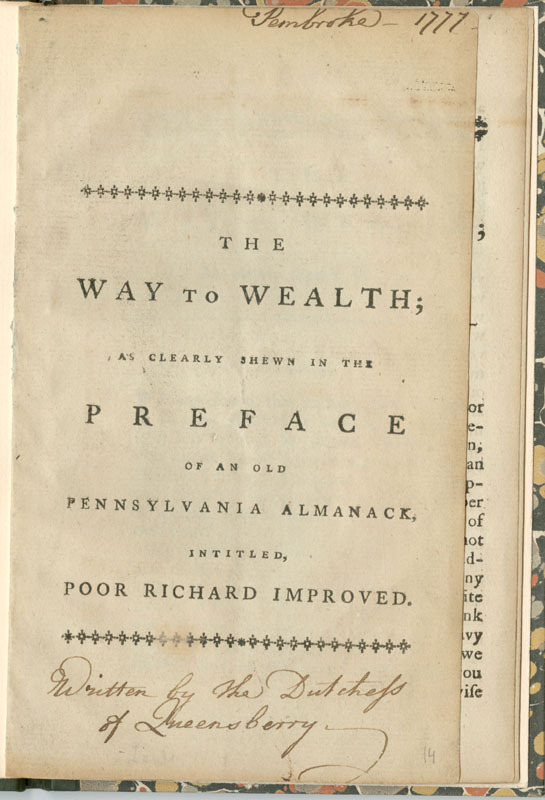 Poor Richard began to put together rhymed proverbs to compose the precepts for “How to get RICHES” ten years before the publication of his 1758 preface, which, in a revised version, became The Way to Wealth. [Benjamin Franklin], Poor Richard Improved: Being an Almanack…for…1758 (Philadelphia: Printed and sold by B. Franklin and D. Hall, ). 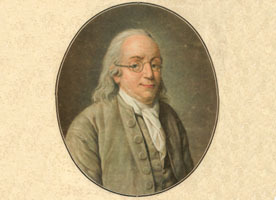 Franklin first published what later became known as The Way to Wealth as the preface to his almanac for 1758. It began at the top of the left-hand page and continued in the available spaces on the calendar pages. [Anne Fisher]. 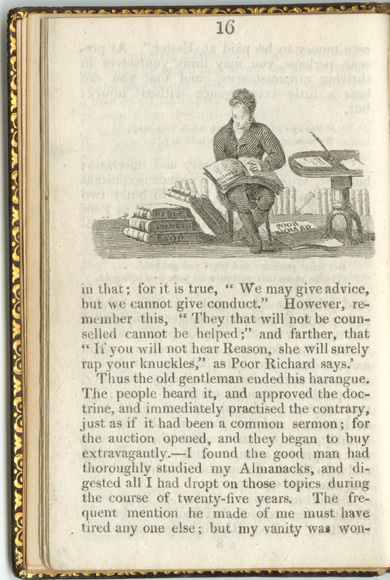 The Pleasing Instructor: Or, Entertaining Moralist (Boston: Printed by Joseph Bumstead, 1795). 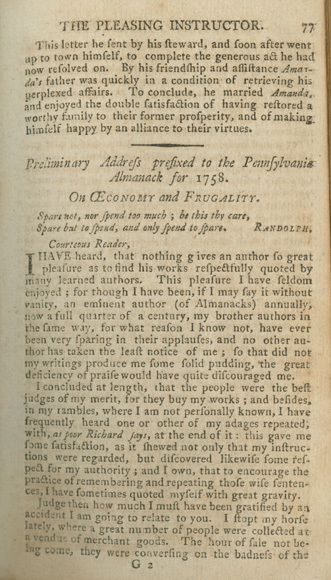 From 1760 on, Franklin’s 1758 preface circulated widely under the title “On Oeconomy and Frugality” in Anne Fisher’s reader for children, which was reprinted many times in England. 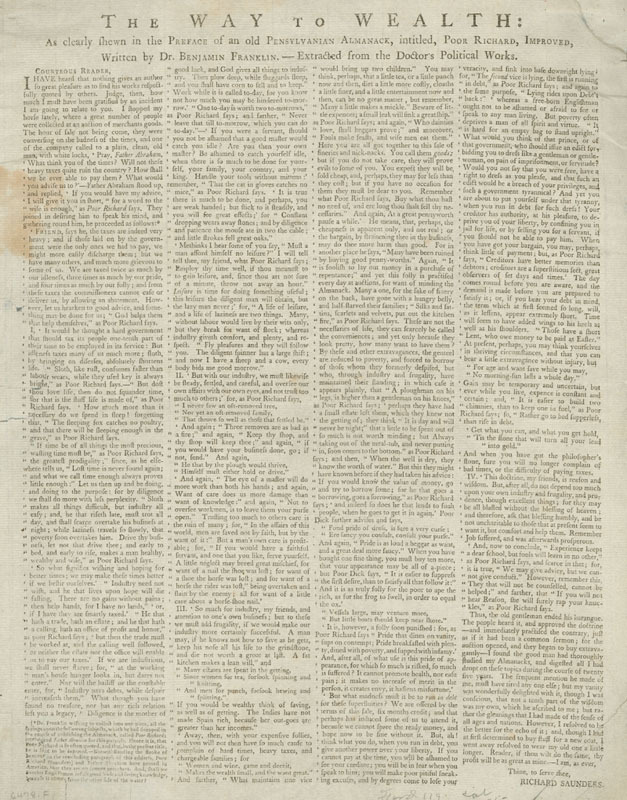 The Boston edition above was, however, the only American edition. [Benjamin Franklin], The Way to Wealth (London[? ], 1775[?]). 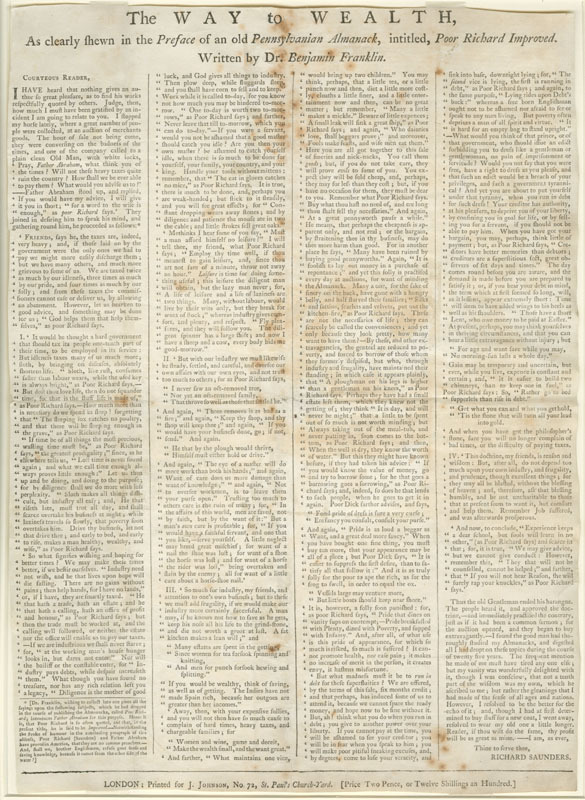 This unbound, anonymous pamphlet, made out of a half sheet of paper folded to make eight octavo pages, and without a title page, is typical of the early editions circulating on both sides of the Atlantic. [Benjamin Franklin], The Way to Wealth (London. 1774). Weg zum Glück, Oder: Das Leben von Dr. Benj. Franklin (Ephrata, Pa.: Benjamin Mayer, 1796). 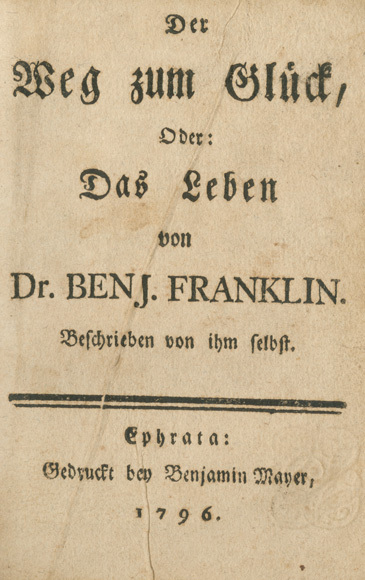 This German edition of The Way to Wealth, printed in 1796, was probably being read by a bilingual reader in the second half of the nineteenth century. 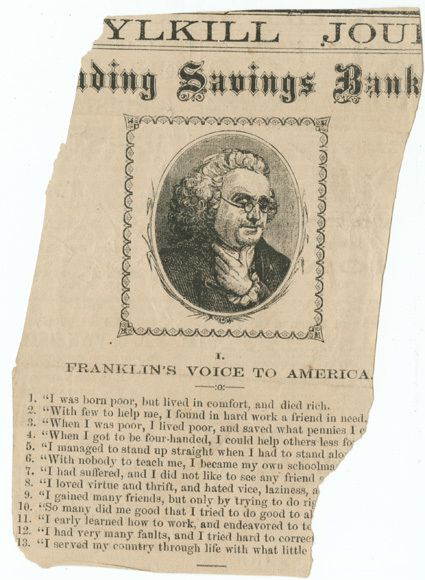 The reader tore out an image of Franklin from an 1872 copy of an English-language newspaper, the Berks and Schuylkill Journal, to use as a bookmark. The cut depicts a young man reading “Solomon’s Proverbs” with a broadside sheet of “Poor Richard” on the floor. It is juxtaposed with other “classics,” including the Bible. The Way to Wealth or Poor Richard Improved by Benj. Franklin./ La Science de Bonhomme Richard, ou Moyen Facile de Payer les Impôts. Par Benj. Franklin, trans. A. F. Quetant (Paris: Antoine Renouard: 1795). Historical Society of Pennsylvania. Despite its small size, this is a luxury bilingual edition with extra-wide margins. The French introduction draws particular attention to the high quality of the frontispiece engraving of a miniature by J. S. Duplessis. The Art of Making Money Plenty in Every Man’s Pocket, by Dr. Franklin (New York: Samuel Wood, 1811[?]). Rebuses like this provided radical abridgements of The Way to Wealth for children. 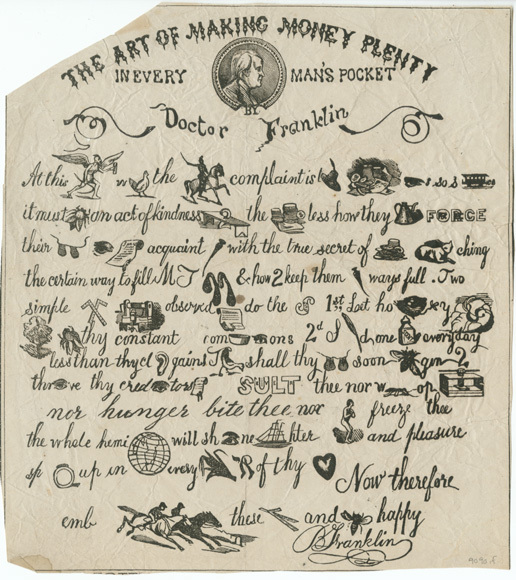 The Art of Making Money Plenty in Every Man’s Pocket, by Doctor Franklin [American, c. 1840]. This rebus is printed as a broadside so that it can be stuck up on the wall at home or school. Note the author portrait. 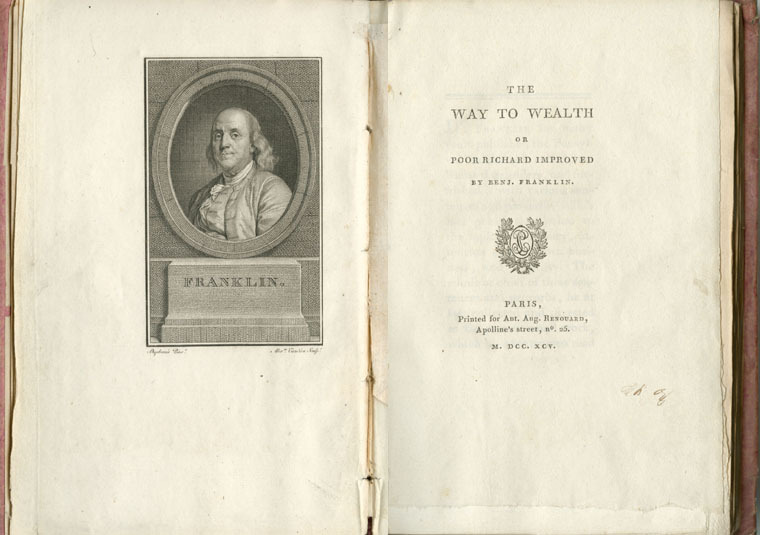 Benjamin Franklin, The Way to Wealth (London: printed for J. Johnson, ca. 1775). 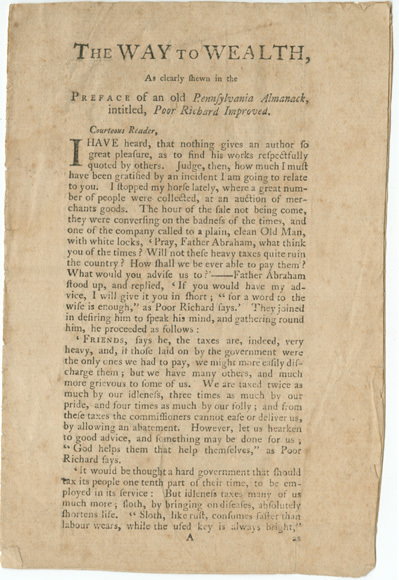 In his autobiography, Franklin wrote that The Way to Wealth was “reprinted in Britain on a Broadside to be stuck up in Houses.” It may have been in this broadside that the name of the author and the title The Way to Wealth were first brought together. This is the only known copy. Benjamin Franklin, The Way to Wealth… Extracted from the Doctor’s Political Works (London, [1780?]). 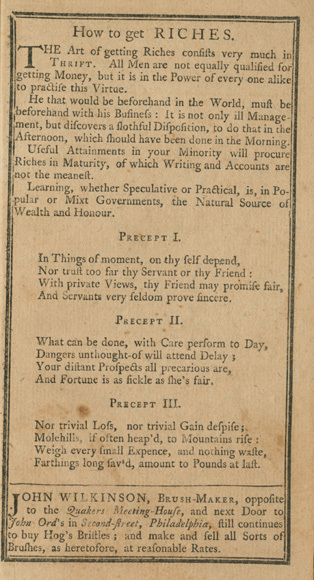 A later broadside printing, presumably after 1779 because of the reference in the title to Franklin’s Political, Miscellaneous, and Philosophical Pieces, published in London by J. Johnson in 1779.